Relation to the En Sof. Potencies or agencies by means of which, according to the Cabala, God manifested His existence in the production of the universe. 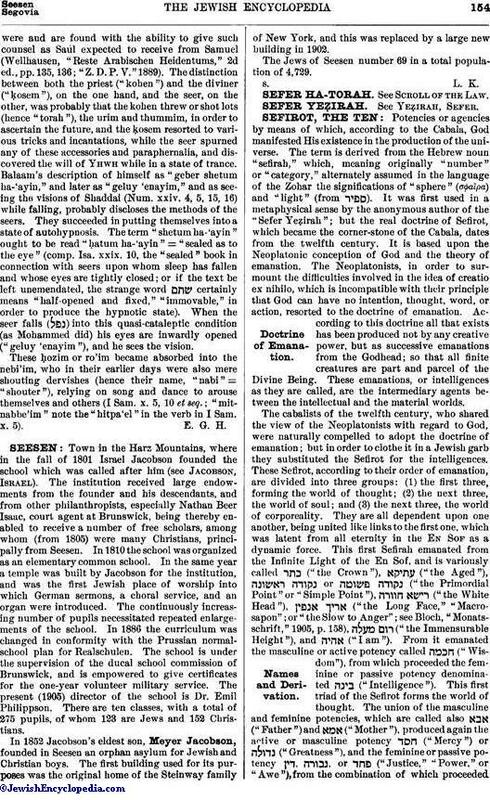 The term is derived from the Hebrew noun "sefirah," which, meaning originally "number" or "category," alternately assumed in the language of the Zohar the significations of "sphere" (σφαῑρα) and "light" (from ). It was first used in a metaphysical sense by the anonymous author of the "Sefer Yeẓirah"; but the real doctrine of Sefirot, which became the corner-stone of the Cabala, dates from the twelfth century. It is based upon the Neoplatonic conception of God and the theory of emanation. The Neoplatonists, in order to surmount the difficulties involved in the idea of creatio ex nihilo, which is incompatible with their principle that God can have no intention, thought, word, or action, resorted to the doctrine of emanation. According to this doctrine all that exists has been produced not by any creative power, but as successive emanations from the Godhead; so that all finite creatures are part and parcel of the Divine Being. These emanations, or intelligences as they are called, are the intermediary agents between the intellectual and the material worlds. The cabalists of the twelfth century, who shared the view of the Neoplatonists with regard to God, were naturally compelled to adopt the doctrine of emanation; but in order to clothe it in a Jewish garb they substituted the Sefirot for the intelligences. These Sefirot, according to their order of emanation, are divided into three groups: (1) the first three, forming the world of thought; (2) the next three, the world of soul; and (3) the next three, the world of corporeality. They are all dependent upon one another, being united like links to the first one, which was latent from all eternity in the En Sof as a dynamic force. This first Sefirah emanated from the Infinite Light of the En Sof, and is variously called ("the Crown"), ("the Aged"), or ("the Primordial Point" or "Simple Point"), ("the White Head"), ("the Long Face," "Macrosapon"; or "the Slow to Anger"; see Bloch, "Monatsschrift," 1905, p. 158), ("the Immensurable Height"), and ("I am"). From it emanated the masculine or active potency called ("Wisdom"), from which proceeded the feminine or passive potency denominated ("Intelligence"). This first triad of the Sefirot forms the world of thought. The union of the masculine and feminine potencies, which are called also ("Father") and ("Mother"), produced again the active or masculine potency ("Mercy") or ("Greatness"), and the feminine or passive potency , or ("Justice," "Power," or "Awe"), from the combination of which proceeded ("Beauty"). These are the second triad of Sefirot, forming the world of soul. From the medium of the second triad, i.e., , proceeded the masculine or active potency ("Triumph"); this again gave birth to the feminine or passive potency ("Glory"); and from the union of the two proceeded, ("Foundation"). This triad of the Sefirot constitutes the world of corporeality or the natural world. The tenth and last Sefirah, called ("Kingdom"), is the sum of the permanent and immanent activity of the other Sefirot. Thus each triad is a compound of force, counter-force, and their connecting link; namely, active and passive agents and combination. 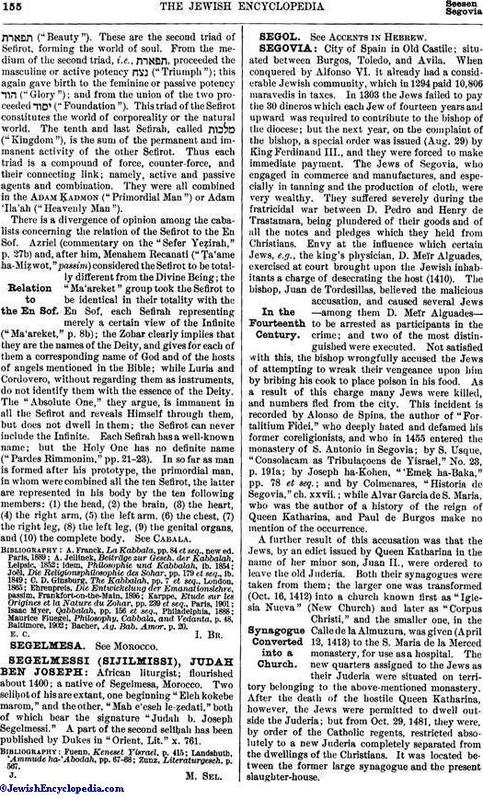 They were all combined in the Adam Ḳadmon ("Primordial Man") or Adam 'Ila'ah ("Heavenly Man"). There is a divergence of opinion among the cabalists concerning the relation of the Sefirot to the En Sof. Azriel (commentary on the "Sefer Yeẓirah," p. 27b) and, after him, Menahem Recanati ("Ṭa'ame ha-Miẓwot," passim) considered the Sefirot to be totally different from the Divine Being; the "Ma'areket" group took the Sefirot to be identical in their totality with the En Sof, each Sefirah representing merely a certain view of the Infinite ("Ma'areket," p. 8b); the Zohar clearly implies that they are the names of the Deity, and gives for each of them a corresponding name of God and of the hosts of angels mentioned in the Bible; while Luria and Cordovero, without regarding them as instruments, do not identify them with the essence of the Deity. The "Absolute One," they argue, is immanent in all the Sefirot and reveals Himself through them, but does not dwell in them; the Sefirot can never include the Infinite. Each Sefirah has a well-known name; but the Holy One has no definite name ("Pardes Rimmonim," pp. 21-23). In so far as man is formed after his prototype, the primordial man, in whom were combined all the ten Sefirot, the latter are represented in his body by the ten following members: (1) the head, (2) the brain, (3) the heart, (4) the right arm, (5) the left arm, (6) the chest, (7) the right leg, (8) the left leg, (9) the genital organs, and (10) the complete body. See Cabala. Bacher, Ag. Bab. Amor. p. 20.